Nickel Creek Platinum’s Nickel Shaw Project in the Yukon. 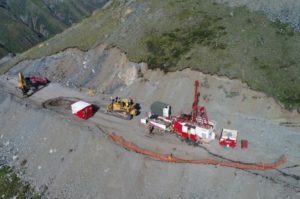 Source: Nickel Creek Platinum Ltd.
Nickel Creek Platinum Ltd. [NCP-TSX; NCPCF-OTCQX], a company previously known as Wellgreen Platinum, says it postponing a preliminary economic assessment at its flagship Nickel Shaw Project in the Yukon until market conditions and the price of nickel improves. The announcement follows the conclusion of a Phase II metallurgical program that identified a strong correlation between nickel recoveries and total sulphide content at the Nickel Shaw Project. “Specifically, it was determined that the presence of sulphides (namely sulphur in pyrrhotite) was an important marker of nickel recovery, meaning that areas of higher sulphur yielded higher recoveries, and areas of lower sulphur yielded lower recoveries, irrespective of nickel head grade which remains relatively consistent throughout the deposits,” the company said in a press release. Nickel Creek has incorporated these findings into a nickel-sulphur recovery formula and tested it against numerous recent and historical metallurgical testwork results. By applying the nickel sulphur recovery formula, the company estimates that the project’s 2017 stated mineral resource tonnage would be reduced by approximately 10% using a nickel price of US$8.25 a pound. “Given this new understanding, combined with current and projected long term commodity prices and financial market conditions, the company believes it wouldn’t be prudent to complete the PEA until the emergence of improved financial market conditions and a stronger commodity price environment, and notionally not until nickel prices settle in a range of US$9 to US$11 a pound, the company said. The Nickel Shaw Project hosts a measured and indicated resource of 362 million tonnes, containing 2 billion pounds of nickel, 1 billion pounds of copper and 6 million ounces of platinum group metals, plus gold. News of the postponement comes after Nickel Creek recently went through a rebranding exercise spearheaded by a new management team led by President and CEO Diane Garrett. As part of that process, the company said it planned to launch a mini pilot plant test program involving the production of separate nickel and copper concentrates and the qualification of the grades and recoveries of those concentrates. This followed a decision to try and improve the economics of the project via the production of separate nickel and copper concentrates. “We don’t want the nickel going into the copper concentrates because we wouldn’t get paid for the nickel,” explained Heather White, the Chief Operating Officer at Nickel Creek during an interview with Resource World Magazine. She said the test work was being conducted at Glencore AG labs in Sudbury, Ontario. Precious metals (PGMs and gold) and cobalt will be measured in the concentrates. “The commencement of mini pilot-plant testing is the final stage of the metallurgical testing at the Nickel Shaw Project,” said Garrett. Meanwhile, the company will follow-up on the 2018 field season program, maintain environmental base line activities, consider optimization alternatives and investigate other opportunities. Nickel Creek shares were unchanged on the news and traded at 10.5 cents in a 52-week range of 35 cents and 9 cents.